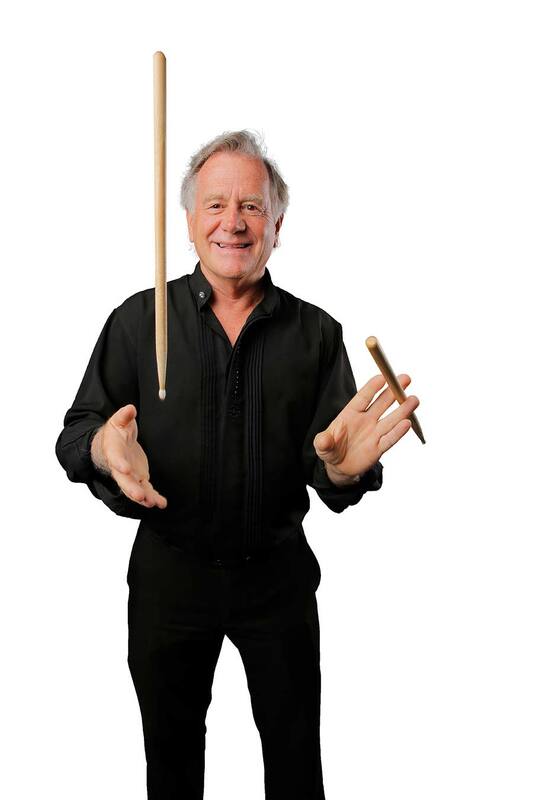 Ted Skolits finds his beat playing drums for Villages bands. Ted Skolits never imagined he’d be working so hard in his 60s. Most residents in The Villages focus on R&R—rest and relaxation—right? But Ted focuses on a different form of R&R—rock ’n’ roll—playing drums in two bands while also working part time. In fact, he’s playing more gigs now than during those 15 years of early adulthood when by day he was a mild-mannered computer programmer for RCA and J.P. Morgan, and by night a drum-pounding, Led Zeppelin-loving rocker in a New Jersey band called Kicks. “That was always my outlet,” says Ted, who was influenced by his dad’s big band favorites, like drummers Buddy Rich and Gene Krupa, as well as Benny Goodman and Duke Ellington. After years of playing clubs, family kicks eventually replaced musical kicks—Ted married and had three kids—until he relocated to Central Florida and discovered the “unbelievable” talent in The Villages. Ted drums for the popular band Flashback, led by singers Ralph DiNome and daughter Dawn DiNome. Earlier this year, Flashback performed on a Caribbean cruise ship for a few hundred Villager fans. Ted also plays with a newer band, No Regrets, and he’s the DJ for the Singles N Dance Club and occasionally hosts Tune Trivia gigs. Ted loves the variety of playing Flashback’s 1950s and ’60s pop, and No Regrets’ ’70s and ’80s rockers, and particularly enjoys drumming on slow power ballads behind an “awesome” singer like Dawn. Ted and his brother John had first performed Blues Brothers songs for their sister’s prom at, of all places, the Princeton Country Club in New Jersey. They later recruited younger brother Rob and some friends and put the songs into their band’s set list. Thirty-eight years after he and his brothers had last performed a Blues Brothers routine in Jersey, Ted got the band back together “on a mission from God,” as Elwood Blues would say. They staged benefit concerts for the forest children, and in February raised several thousand dollars for the church’s Operation Homebound meals program. Ted’s brothers John and Rob performed as Jake and Elwood, respectively, backed by local musicians and other Skolits family members who came in from around the country. Ted’s children Teddy, Kevin, and Katie performed, and one comedy bit even included his mother, Terry, 91, who lives in the Village of Silver Lake. While arranging the show was time-consuming, Ted’s not taking a breather. He bought an electronic drum set so he can practice at home and match the competitive, but friendly, spirit in The Villages. Ted Skolits will perform with Dawn DiNome and Flashback April 13 at Laurel Manor Recreation Center, 1985 Laurel Manor Drive (open to public, $10), and April 20 at Lake Sumter Landing Market Square; and with No Regrets April 12 at City Fire restaurant at Lake Sumter Landing Market Square and April 14 at Spanish Springs Town Square.